The leading cause of death among seniors is falls. Two-thirds of seniors who fall will fall again within 6 months. Each year nearly 20,000 deaths and 21 million medical visits are due to preventable injuries in the home. The average cost of a fall related injury for a senior is $19,000. Have you fallen recently, or are you afraid of falling? 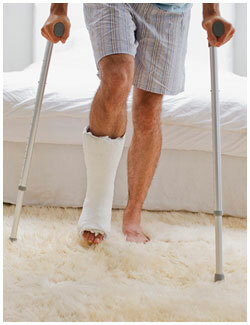 Falls are one of the most preventable causes of injury and hospitalization. As medical professionals, we regularly work with individuals who have experienced injuries and falls due to avoidable hazards in the home. Identifying the fall risk areas in your home. Recommending the right equipment and home adaptations to keep you living safely and independently in your own home.